Birch Cabin is the epitome of lakeside comfort. Located just north of Boulder Junction on Big Kitten Lake, guests enjoy sunset lake views from the three-season screen porch and private pier. 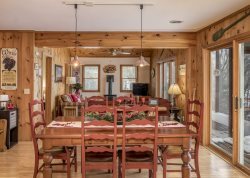 With a modern kitchen, this cabin is the ideal couple or family vacation rental in any season - play on the water in the summer, take in the Northwoods’ stunning fall colors, or ring in the New Year in the winter. This lakeside cabin, while privately owned, also enjoys access to amenities from the nearby resort: a shared beach, outdoor fire area, tennis court, playground, and watercraft. Spend your days at Birch Cabin kayaking, fishing, swimming, and sunbathing, then cozy up in the living room under a cathedral ceiling to watch the flames dance in the fireplace. In the winter, snowshoe right from your front door, or connect with an abundance of local trail systems for cross country skiing, snowshoeing, fat tire biking, and snowmobiling. Birch Cabin is a place to reconnect with loved ones while taking in the beauty of the Northwoods around you. 1st floor: 2 bedrooms (1 king bed, 2 twins) with a full bathroom. 2nd floor: 1 bedroom (1 queen bed) with a half bathroom with laundry. Amenities include generous steps to a private pier, shared sandy beach, portable campfire, gas fireplace, microwave, coffee maker, refrigerator, dishes + utensils, laundry: washer/dryer, charcoal grill, linens included, towels included, on snowmobile trail. Everything was seamless .They made everything so easy. Great communication every step of the way! The cabin is impeccably clean and so comfortable. You feel at home the moment you walk in. Very prompt responses to all my email questions! Clean, cozy, and beautiful cabin and view! Experience was very good. Very helpful and informative. Wonderful cabin! Clean and comfortable. Right on the water. Easy access to the boat pier. Loved it! The property was great! The pictures are a little off - the house was smaller than we expected and we did not know that the neighbors would be right on top of us on both sides. Lake was beautiful and use of sailboat, kayaks and canoes was great to have. Loved that the house was so clean! You must have an outstanding cleaning staff! There was not one cobweb anywhere in the house or spot of dust in any corner. Would have liked information on how to work the TV - even my tech heavy kids gave up on it. We finally did get it working the final evening we were there. Would also like more info on what kitchen items are actually in the house. I brought along a lot of extra stuff for kitchen and it was all there already. Also nice that there is a full size washer and dryer in this house and detergent. Also dragged along fans and found that there were some already there. Thank you for all your input... We are putting together detailed inventory list so you won't need to bring extra items. The team was great and allowed for a seamless check in and check out like we owned the cabin. We really enjoyed the cabin and the property, and had a great vacation. We used all of the watercraft and the swimming area every day, and spent our evening on the porch playing games, eating summer sausage, and listening to the loons. The refrigerator was broken prior to arrival but Julie was very accommodating and called us ahead of time to let us know. She gave us full access to a second cabin while they addressed the issue and was very communicative during the process. Great property. I've stayed at Wildcat for several years in a row now and will keep you in mind every time I plan a trip. Tell us about your favorite feature of the property. ..Easy access to the lake with a private dock. While not used, the washer and dryer was a very nice amenity to have access to. We enjoyed our 3 night stay at Wildcat Cabins on Wildcat Lake. The property was close to the snowmobile trail (which we where in the area to do) and close to Boulder Jct. and local places to eat, fuel, shop. Would definitely stay here again. Julie did a great job and took care of all of our needs. It was wonderful! Everything about the cabin was wonderful! We very much enjoyed our time there and look forward to staying there again in the future. Julie was AMAZING!she responded to every question I had within minutes and was very nice and professional. It was just an amazing time! My 2 children now have wonderful memories for life. We will be baxk next year! This was our first year in Birch cabin and we absolutely loved it. We felt right at home, right from the beginning! What was your reason for visiting? My family has been going up north my whole life. For me, it is the best kind of vacation. This resort is awesome for families, as there is fishing, boating (kayaking) and a beach. I appreciate this, as many "resorts" do not offer these.....Tell us about your favorite feature of the property.The view!! Also the beach and availability of kayaks. Having a washer and dryer was also incredibly helpful! Julie was very professional and helpful. Stayed for a long weekend getaway in the Birch cabin. Cabin was very clean and had all of the amenities needed for a comfortable stay. Three season room was very nice to enjoy an evening sunset or your morning coffee. Julie was great to deal with. Very professional and prompt with answers to questions. Will definitely return! Tell us about your favorite feature of the property? The three season room was wonderful! Wildcat Lake is a 293 acre lake located in Vilas County. It has a maximum depth of 38 feet. Visitors have access to the lake from a public boat landing. Fish include Musky, Panfish, Largemouth Bass, Smallmouth Bass and Walleye.